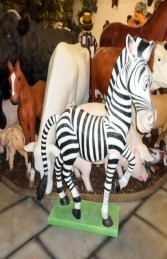 This is a wonderful life-size model of a cartoon Zebra, it is ideal to use in a jungle or safari themed area or even as something different for your garden. Our resin Zebra statue has been used by many customers to great effect; from adding interest to a safari themed crazy-golf course to causing a stir in a suburban garden. The Zebra looks really fantastic in combination with our comincal tiger (JR C-035). 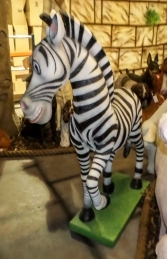 This model can be used in any Jungle or Safari themed areas in adventure golf courses, zoos, theme-parks or to promote shops, businesses, pubs, restaurants, coffee shops. 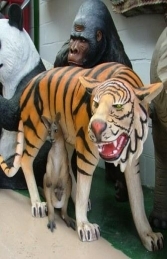 It would even look fabulous in your own home or garden.